* Annual estimated passenger usage based on sales of tickets in stated financial year(s) which end or originate at Cradley Heath from Office of Rail and Road statistics. Methodology may vary year on year. 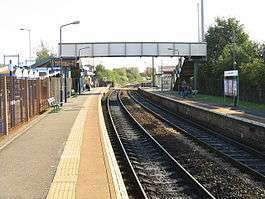 Cradley Heath railway station serves the town of Cradley Heath in the West Midlands of England. It is located on the Birmingham to Worcester via Kidderminster Line. The station is managed by London Midland, who provide the majority of train services; there are also occasional services provided by Chiltern Railways. Cradley Heath is the nearest station to the Merry Hill Shopping Centre in Brierley Hill, and connecting bus services are provided. As a consequence, it is the station with the most Plusbus ticket sales (tickets for both rail travel and the connecting bus journey).. Cradley Heath bus station is situated right in front of the railway station, thus effectively forming a Cradley Heath Interchange. The station was opened in 1863 by the Stourbridge Railway, on their line from Stourbridge Junction to Old Hill. This was later taken over by the Great Western Railway, who incorporated it into their line to Birmingham. Historically, the station was known as Cradley. Tony Rivers, a man from Netherton, saved a woman who was trapped on the line at the station and was subsequently awarded the George Medal. The present station buildings date from the mid-1980s when the station was rebuilt entirely on the west side of the level crossing. Previously there had been a staggered platform arrangement on either side of the crossing. During Monday to Saturday daytimes, there are six trains per hour in each direction, operated by London Midland, between Birmingham Snow Hill and Stourbridge Junction. Many of these continue beyond Stourbridge to Kidderminster, Worcester Foregate Street or Great Malvern, and beyond Birmingham to Whitlocks End, Stratford-upon-Avon, Dorridge or Leamington Spa. During evenings and on Sundays, there are typically two trains per hour. There are also occasional trains during peak periods to and from London Marylebone, provided by Chiltern Railways. Regular direct services to and from Birmingham New Street (the terminus for all eastbound trains between 1967 and the reopening of the line to Snow Hill in 1995) ceased in May 2004 and passengers wishing to travel there must now change at Galton Bridge. Alongside the railway station there is a bus station with five bus stands, which opened during the 1980s. The bus station was extensively rebuilt from 2014 to 2015, and reopened in July 2015 as Cradley Heath Interchange. The bus station is owned and operated by Transport for West Midlands which charges operators for their usage. Wikimedia Commons has media related to Cradley Heath railway station.